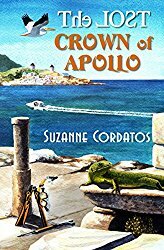 Today's guest on our blog is the lively and lovely Suzanne Cordatos, author of The Lost Crown of Apollo and other children's books. 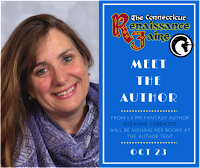 She is writing about a very special Faire that she enjoys attending in her home state of Connecticut. Over to you, Suzanne! 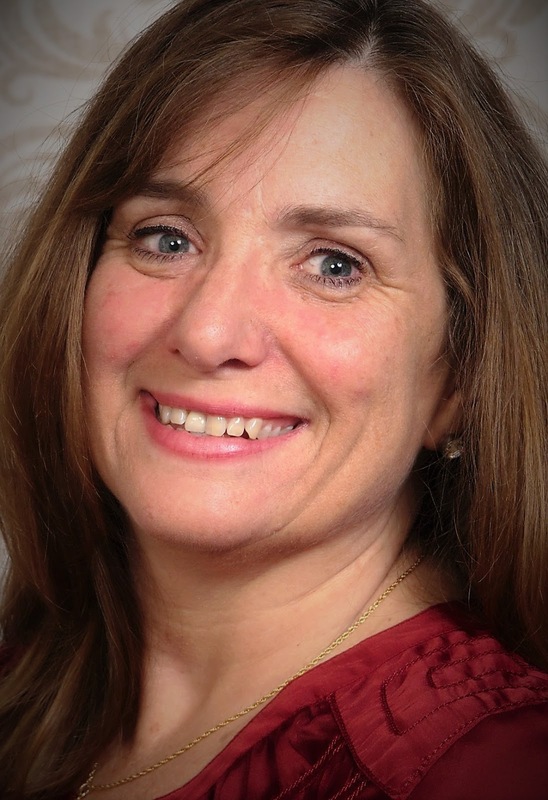 "When my first books were released in the past year—a heady rush of a middle grader’s novel and two picture books for the younger set—I put on my author marketing hat. I had been waiting for this day to come for years. This side of becoming an author did not scare me, because I manage outreach communication for a career. I love meeting young readers, teachers, librarians, talking about the writing process. All of it! Put out a notice on my facebook page and kidlit author groups. Wrote articles for my blog. Researched the local area for author fairs, holiday markets, library story times. The big Barnes & Noble store has been supportive, inviting me to at least three or four author book signing events. Doing these activities, I have met lots of great people, but book sales have not exactly made JK Rowling shake in her shoes from the competition. Children love my books when they’re introduced to them. 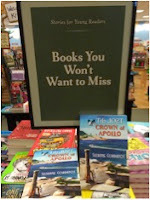 THE LOST CROWN OF APOLLO is a mystery/boating adventure set in ancient ruins on a Greek island, and my picture series is about a fun-loving little dragon who gets into big friendship dilemmas, with titles CAMP DRAGON-FIRE and SNEEZE-FIRE. The usual things weren’t reaching enough kids (or their wallet-carrying parent) fast enough. Where could I find readers? I needed something UNUSUAL. Ok, this isn’t me, but it IS my book! On my writer’s desk I have small figurines that remind me of the books I’m writing, such as the cute little dragon I bought at a Renaissance Faire years ago. The Faire! Dragon-fighting knights and ladies! The Faire is a wacky event that allows people to dress up in medieval attire, walk around eating huge turkey legs and shout “Huzzah!” at jousting matches. I met this dragon-costumed character at the Faire, who sells dragon-flavored ice cream and bought my book to read to kids in hospitals around the country, dressed as a dragon. WOW! Held in my state, Connecticut, in early fall each year, people also attend the Faires to shop. Booths sell everything from fairy wings to dragon figurines. 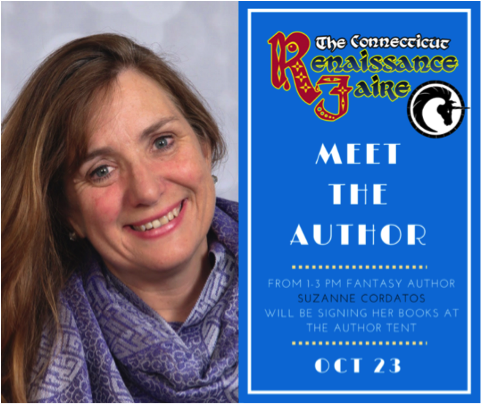 A booth would be impossibly expensive for me to rent, but I searched online for the next Faire anyway—it was only March—and learned the organizer wanted to host a free “Author’s Tent” booth for the coming fall. I was the first to respond and by October, there was a waiting list of authors. 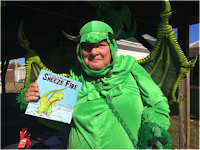 I sold 15 books in about two hours of fun at the Faire and have a wonderful invitation to come back this year and be a storyteller with my dragon books not just stand at a booth! They put out this nice ad ahead of the Faire, too. To find readers for THE LOST CROWN OF APOLLO, I reached out to Greek food festival coordinators. A few worked out to solid success, but I ran into the high cost of space rental. However, a Greek Orthodox Sunday School teacher invited me to do a book talk after church one day. The kids worked on a simple book-related craft project I had brought while they listened to a book talk about taking travels to Greece and spinning a tale. The parents snapped up copies and the Sunday School director bought five for the church library. My strategy, rather than waiting for the next random author invitation, is to send a copy of the book to several Greek churches in the region and ask if I can get on their schedule to bring a craft, books and talk to their kids about my love for Greece and writing." Suzanne, thank you! What a lovely vibrant post. We love your marketing approach and it shows shows that outlets for books can be found in all sorts of unusual places. For anyone interested in the Faire itself, here is a link Suzanne has sent us. Great ideas! Thanks so much! These can be whittled into shape for whatever authors write! Loved this post. Suzanne has such terrific ideas! Thank you, Stephanie! That's it--finding our readers where they are which, in this day and age is unfortunately not necessarily a bookstore. Thank you very much. Happy reading and writing!